French Polynesia is located at the center of south Pacific and is made up of more than 150 islands and small islands.Some of these have a volcanic origine like the archipel lago of the "société" made up of "iles du vent" with Tahiti, Moorea, Maiao, Tetiaora, Mehetia and of "iles sous le vent" with Huahine, Raiatea, Tahaa, Bora-Bora, Maupiti, Tupai, Mopelia, Scilly, Bellinghausen and the archipel lago of the Marquises with Nuku Hiva, Hiva Oa, Ua Pou, Ua Uka, Yahuata, Fatu Hyva.From another islands have a coral origin like the archipel lago of Tuamotu with Rangiroa, Tikehau, Manihi, Fakarava (biosphere classified by UNESCO), the Gambier islands, the Tubai islands called also Australes islands. The volcanic islands are inserted regulary and owe their survval only with the corals which develop on the surface. The names are evocative and have the magic sonority of the language Maori.The french Polynesia is an incredible diversity of landscapes, they are the vahines with the languid step, it's the kindness of the population, the beauty of the lagoons and of sea-beds, the ennivrant perfume of the flowers of tiaré, the tropical vegetation, the mystery of the black pearls, the extraordinary culture Maori, the rythm of the ancestral dances, the typical gastronomy, the artists...All here is only beauty, charms and sensuality! Moorea means "the yellow lizard"
Moorea holds this name of a large Tahitien head.Formerly, the island also bore the pretty name of Eimeo which had as a significance "to eat hidden".Indeed, the island was the refuge of the fugitive Tahitiens warriors. Volacanic solid mass of a surface of 135 km2, Moorea was born approximately two million years ago and it's the sister island of Tahiti.They are distant of 17 kms. Only 7 mn in the plane to find itself on an island of an exceptional beauty. The flowers are abundant, the lagoon is marvellous.Moorea is regarded as one of the most beautiful islands of Pacific.One can see there superb landscapes of mountains and valleys whose green contrasts marvelously with the turquoise of the lagoon. The light is magic there because of the very marked relief of the island and the sunset are single. The mount Rotui, the such guard of remote time , mysteries and magic, offers a dazing spectacle.He rises until 899 m and is framed by two superb bays, the bay of Cook and the bay of Opunohu.The Captain Cook remained in the bay which bears its name into 1777.The bay of Cook was called at the time "PAO PAO".The bay of Opunohu is more savage.At the end of this bay rises TOHIEA or "touth of shark", a superb rock piton. Moorea is an island which one cannot not visit and who it's often difficult to leave. It's a true pearl of Polynesia, a garden of Eden where time doesn't have any more course, where one forgets all...one is at the end of the world, Moorea bewitched us. It's a large and fabulous butterfly which spreads its wings Pacific on the open ocean. District TIAHURA is located at the North-West of the island.It's the paradise of the water sports, of the walks in boat, the diving but also of the relaxation and the softness of living. The island is a rapture of each moment.The flora is generous and splendid.The grass sprinkled so well by the tropical rains pushes of a luminous green.Pastures surrounded by coconuts shelter sheep and cows.It's an atonishing spectacle that this small "Noemandy" wedged between the cocoteraies. 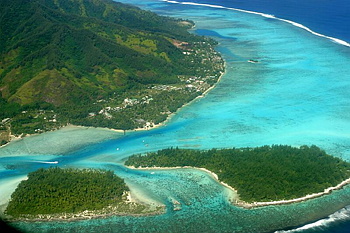 For discovering Moorea well, it's necessary to spend several days there. It's necessary to see the vahines braiding chains of flowers while tanes play of the ukulele.It's with dexterity, always smiling which they braid the crowns of flowers that they will carry the evening to dance, in the shade of the tumu uru, the breadfruit tree. The flowers are significant social which goes from the offering of a chain of flowers as a sign welcome (maeva as a Polynesian) to the warlike ornaments of savage tanes. - To make a ballade on the lagoon of day or with laying down sun to admire splendid colors. - To make diving or quite simply to put palms and tuba to admire the fabulous decoration of sea-beds. 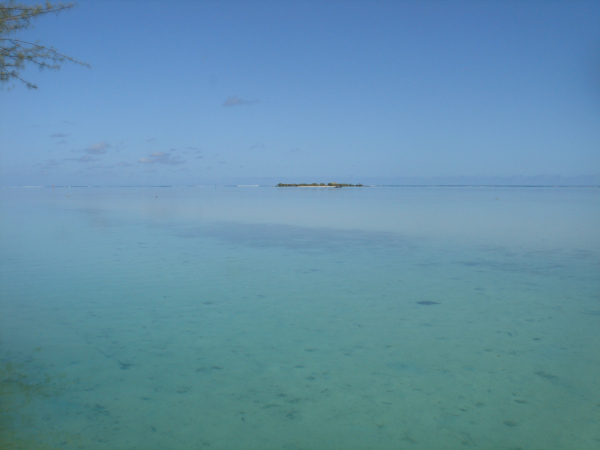 - To stop from the point of view of Toatea with Temae.It's a true postcard and the sight on Tahiti is splendid. - To visit the two bays, Bay of Cook and Bay of Opunohu. 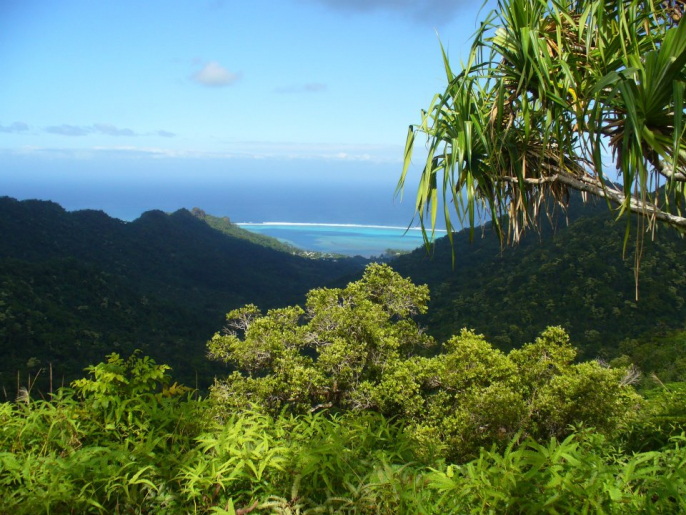 - To go to the view point, the center of the island with 240 m of altitude.It's one of the most beautiful panoramas of Polynesia.One can see there the two bays of Moorea separated by the Rotui mount. 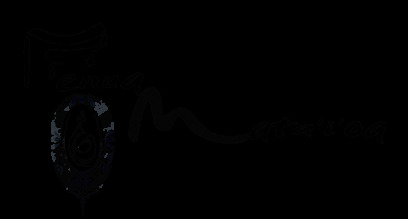 - Discover rays, tortoises, sharks and full with splendid fishes. - To go to see the dolphins showing their spectacle in the sea.In their element, nonconstrained by the man, their plays are so much moving! - To go to make idleness on a motu, to extend in turquoise water and to drink a fresh fruit cocktail there. - to take aperitif on a motu with laying down sun. - From July to October, it's necessary to go to see the fabulous spectacles of the whales come from Antartic to reproduce. You are in Polynesia, think differently! Here, one meets, one embraces oneself and it's natural.It does not have there more constraints;you are in the garden of Eden and in the paradise, there is no more protocol! - When you enter in a fare, you must remove yourshoes, it's the coutume.You shouldn't never enter a house with your shoes.Simplify you the life, walk barefoot, it's a single feeling...you will not be able to put shoes never again! - The Polynesians are extraordinary.If they always don't know the rules of the Europeen protocol, they have on the other hand a great direction of hospitality and they have to learn to us much. Don't seek in Polynesia what you have elsewhere, here you will discover of other things that you will not forget.Discover the true Polynesia, you will have an indelible memory of it. - If you wish to bring back memories of your holidays, see local artists.We will be able to advise you.The island is favourable with creation and you will meet fabulous artists. - Avoid the circuits ''in herds'', you will be desappointed.They are many possibilities of discovering Moorea under marvellous conditions...avoid the discoveries with ''50 persons''...even the lines also hate these attroupements! !There too, we will be able to advise you. - The weather is always hot in Polynesia, envisage only light clothing, you don't overload, the relaxed behaviours are required.For the women, adopt the pareo.You will be never so beautiful as with a coloured pareo, naked feet and a flower in the hair. - Avoid exposing you to the sun during the hottest hours and envisage good sun lotions.Pay attention with the sunstrokes at the time of the walks in boat.To wear hats or caps of them. The climate is tropical, hot and wet with an important sunning.The rain season extends from December to April but tropical downpours lasts only a very short time and the sun returns quickly.It's the season more hot. The dry season extends from July to October and the evening are more fresh.It's the famous southern winter favourable for the festivities. - Help us to protect the environnement.Don't throw anything elsewhere than in the dustbins.Don't take anything in the plantations and don't break the coral.